Note: this will be the last Upcoming pest events for 2016. Codling Moth (CM) -- Codling moth development as of July 12: 2nd generation adult emergence at 3% and 1st generation egg hatch at 99%. 2nd generation 7% CM egg hatch: July 25, Monday, = target date for first spray where multiple sprays needed to control 2nd generation CM. 2nd generation 30% CM egg hatch: August 3, Wednesday, = target date where one spray needed to control 2nd generation CM. Spotted Tentiform Leafminer STLM -- 2nd STLM flight begins around: June 14, Tuesday. Rough guess of when 2nd generation sap-feeding mines begin showing: July 2, Saturday. Optimum first sample date for 2nd generation STLM feeding mines is July 9, Saturday. Second optimized sample date for 2nd generation STLM sapfeeding mines, if needed: July 15, Friday. Third optimized sample date for 2nd generation STLM sapfeeding mines, if needed: July 25, Monday. Note: this will be the last AgRadar for 2016. Oh, and just for yucks, see this USApple prediction for the 2016 apple crop nation-wide; 91% of last year's apple crop in Massachusetts? I am not seeing it, but maybe we will all be pleasantly surprised! • Oblique-banded leafroller (OBLR) - continue to scout for infested terminals and/or fruit feeding; finding damage on one fruit is enough to trigger a control spray still, however, as the caterpillars have a way of tucking themselves between fruit in under foliage, insecticides get less effective with time, the focus should have been on an earlier control window. • Apple maggot fly (AMF) - should be entering the period of increased activity, particularly if we get some rain. Be ready to apply insecticide when conditions warrant, i.e. you have a history of apple maggot fly activity and/or trap catches. • Japanese bettles (JB) - well, they are out there, but not in alarming numbers yet (at least what I have seen); again, dry weather may be hindering emergence from the ground, but watch out if it starts to rain; many insecticides are effective, but usually need repeat applications. At least there are no peaches for them to get into...but watch the Honeycrisp apples closely. 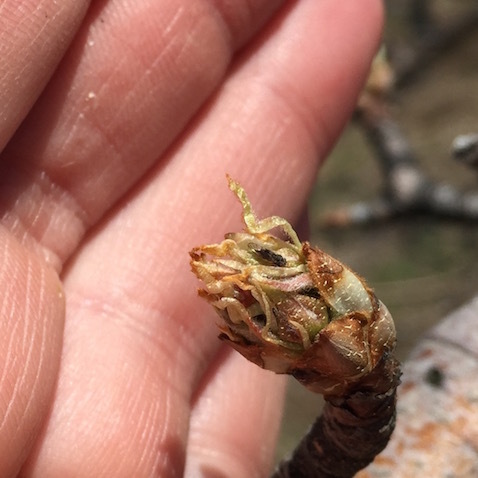 • Pear psylla has been a troubling pest for pear growers in Massachusetts this year. 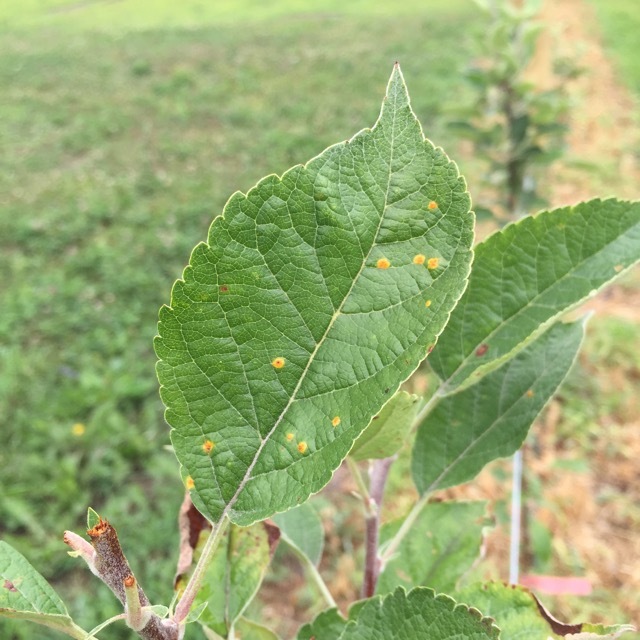 We have been working hard, here at the UMass Orchard, to try to reign this pest in and are still struggling to get good control. 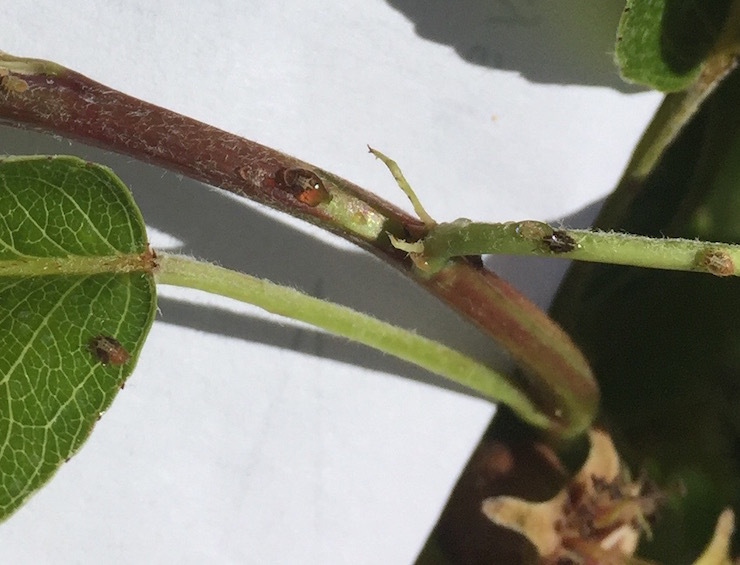 Psylla damage is considered to be indirect as they feed on the tender shoots and excrete honeydew, which serves as a substrate for sooty mold. When population levels get high enough, however, this honeydew drips down onto developing fruit where sooty mold and fruit russet mold will occur. While this can be washed off the fruit at harvest time, it is a time consuming task that achieves only moderate levels of success and significantly reduces financial return on this crop. 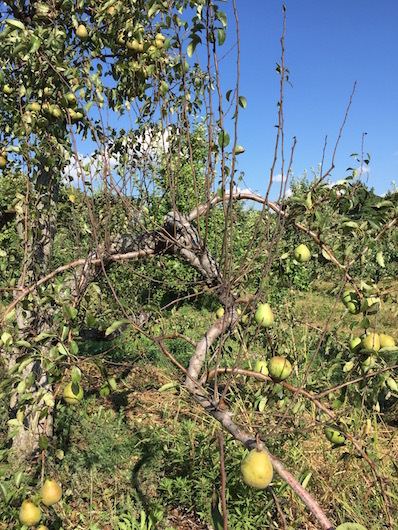 Additionally, permitting psylla populations to go unchecked can cause defoliation of the tree, reduced return bloom and, in the worst of cases, tree death. The one, very key management practice you should be employing right now is not chemical but cultural. Yes, I know, you have a million things to do and going out into your relatively small pear blocks to hand strip water sprouts from the trees is really low on your list. It is, however, a very important means of controlling this pest. Right now the primary season’s leaves and shoots have hardened off and psylla nymphs cannot readily feed on them. They instead feed on the tender water sprouts shooting up into the trees, often shielded from good pesticide coverage. Removing these summer shoots deprives the nymphs of their only food source. No food source = no further growth and they die, just as surely if you sprayed them with an insecticide that may or may not work. One of the biggest challenges you will face in managing this pest is the ease with which they develop resistance to insecticides. • Dry weather is the story here, as it does not favor disease development. Maintain fungicide coverage for summer diseases as necessary, but spray intervals can be significantly extended w/o rain. But don't go any longer than 14-21 days between sprays. 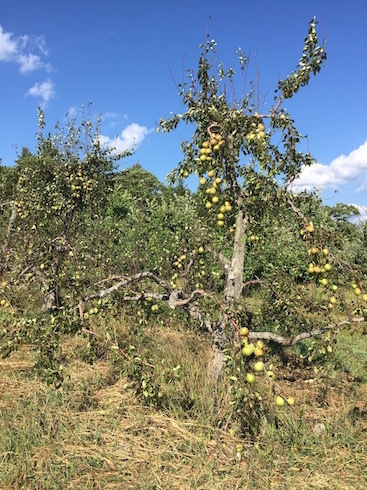 • Summer NAA sprays for return bloom should be ongoing; ditto for calcium sprays (for improved fruit quality and storability); hand-thinning and tree training should be done, but could be finished-up; summer pruning could begin and continue until mid-August; what else is there to say??? The next Healthy Fruit will be published on Tuesday, August 2 (or thereabouts), 2016. As always feel free to get in touch with any member of the UMass Fruit Team (http://extension.umass.edu/fruitadvisor/team-members) if you have questions or comments.